This Tuesday’s ride was the day before the Spring Equinox, but the day was not exactly Spring like. It was however dry after a wet weekend. The weather did not deter the usual Tuesday riders, even I made it out! And better still we had two new faces to add to those of myself, John Dadson, Frank Kippen, Tom Vaz and last but my no means least our only lady of this day, Jenny. Sandra was missing as she is having a second knee op and won’t be out for about a month. So all the best Sandra, and get back ASAP. But the two new faces. Frank had already advised me that he was bringing a friend along, so let me first introduce Dave Gordon. 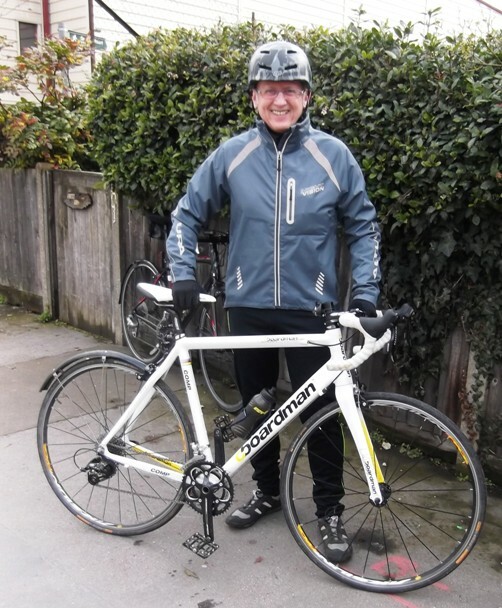 As you can see from the bike, a nicely kitted out Boardman, Dave is not a novice cyclist. Frank tells me he has form as a triathlete so will be a welcome addition to the Anerley B.C should he decide to join us on a permanent or regular basis. John Dadson brought our second new face, Henry Joseph, who also rides a mean machine. This time a Specialised Secteur. 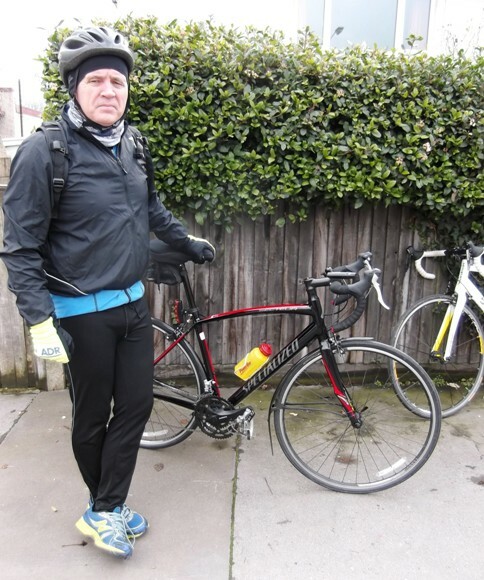 Henry’s sporting interest has been as a long time foot baller, but has now taken up cycling to keep fit and to build up on his several long distance bike rides of last year. And what better place to start the 2013 fitness regime than with the Anerley Bicycle Club! Being a cold and miserable day I had decided on a fairly short ride, but with some hills to start off to get us warm. So off we went, up Foxley Hill on our way out past Kenley Aerodrome and Caterham on the Hill. What goes up must come down, and on this occasion, after the Harrow pub it was the rapid descent of White Hill and over the M25, when Frank found his brakes were in serious need of fettling! After Bletchingley and Rabies Heath Rd it was another quick descent of Tilburstow Hill, where Frank managed to slow down enough for the left turn towards the A22. The heavy rain of the last few days was now very evident. Fields and roads were waterlogged, ditches and some of the country lanes were streams of fast flowing water washing down from the Green Sand ridge. Mudguards were definitely a bonus on this ride! It was shortly after this, just south of Tandridge, that the problem started. There is nothing worse than a rear wheel puncture in the cold and wet. 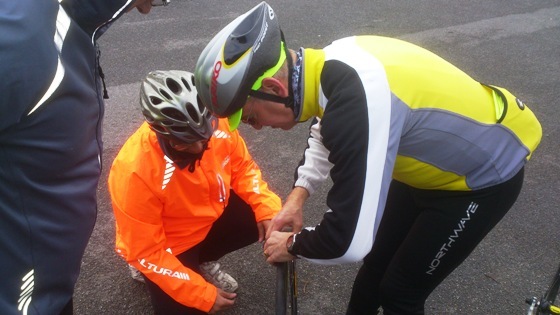 As you can see Anerley B.C did not exactly rush to assist poor deflated Dave as he changed the tube! But at least it was only a couple of miles to the tea stop at Oxted’s Morrisons where we could all warm up over a hot cup of tea. Unfortunately Dave’s problems were not yet over. Coming out after our tea and social stop, the back tyre was again showing a serious lack of air pressure. A quick pump up got us a couple of miles up the road before it was pump up time again. Then again after about another half a mile where a faulty valve was diagnosed in the replacement inner tube. 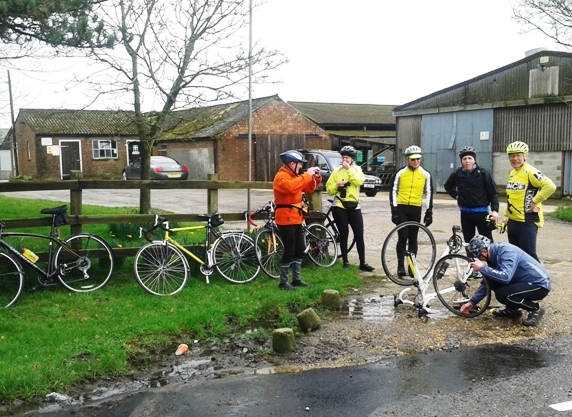 This time the Anerley B.C team came to the rescue, lead by John D who used his spare tube to get Dave home. So that was our Tuesday Ride, not uneventful for Dave, but I hope an enjoyable ride for us all. Next Tuesday we meet at Tesco, Purley at 10 (Coulsdon 10.15 for Jenny) and follow the sun, westwards into scenic Surrey, and we hope joined again by our two guest riders! And a P.S: Our short Tuesday ride (30 miles for me, but more for some of you) was longer than the last Sunday Ride. But then it did rain. And rain. And rain some more for them! P.P.S. Following our last ride I was asked a question about how to improve hill climbing. As we live on the edge of the Surrey Hills I expect we would all like to know how to climb hills better. I certainly would! At Morrisons we discussed my newspaper cut outs with John T giving his robust comments on errors in Daily Mail article on 1948 Olympics medalist Tom Goodwin; praised to the roof Times obituary on world master frame builder Ron Cooper [JT has 4 Ron Cooper frames – worth a fortune]; Bradley Wiggins Tour de France write up [only 10st 8lb at 6′ 3”! ]; Alex Moulton 92 still developing his chassic bike. In Marden Park we saw a superb herd of deer with three stags at the bottom of the western valley slope not far from Woldingham Station. John and Meika no doubt see them as John does his developing cycle practice in Marden Park.